We are finally starting to see some colder temps this week and I'm loving it! Jacket weather is definitely my favorite time of year and this down jacket has been my go-to for 3 years now. I have a couple other EB down jackets, vests and coats and let me tell you - nothing compares in quality or price (they have major sales all the time including today for their Veterans Day sale up to 60% off). Also, don't overlook their fleece pullovers. They are the best! The catch-22 of homeownership and renovating is that there is always something to be done. It really is a blast to have a long list of projects but I have to make a conscious effort to be content and happy in the moment rather than always looking for whatever is over the next hill. 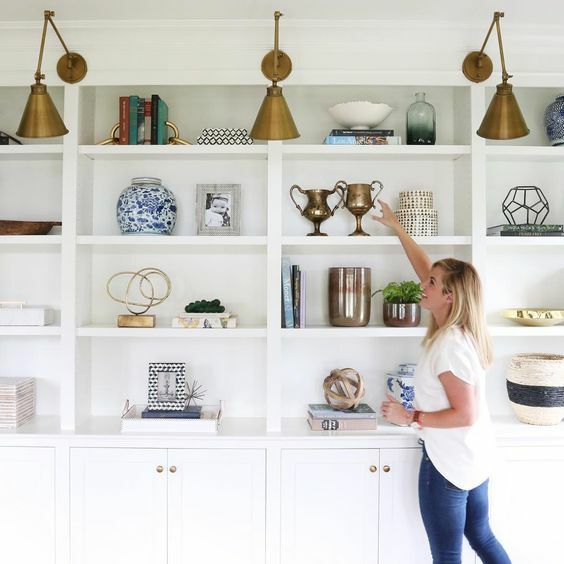 With that in mind, over the last couple of weeks, we have been dreaming up plans for some beautiful DIY custom built-in shelves and cabinets in our living room. John has designed a beautiful plan that we will try to start and finish before Christmas. Fingers crossed! I'll have another post next week with more details. I’m not even going to pretend that I have any chill about getting to style all of the shelves - I’m just so excited!!! I don't like to recreate something exactly from an inspiration photo, however, I wish I could copy and paste this image from Studio McGee into our living room! If you’re wondering about the final reveal of the fence, that’s coming. We were delayed in publishing the post because we were waiting on one final detail to arrive in the mail and then it rained for a couple days, pushing back the reveal even more. Ugh! But it has arrived and now we will get to really be totally and completely done with that project. Stay tuned! These are John’s favorite jeans lately! Probably his favorite thing is the insane stretch in the fabric making them really comfortable for sitting and allow for easy movement, too. They are regularly $45 (a great price) but they are on sale right now for $22 with no additional code needed at checkout!!! I think Im going to get John another pair or two because you can't beat that price! I'm driving down to Atlanta for a girls weekend today and I'm pretty excited about it! We are planning on laying low and catching up for the most part. Dinner tonight somewhere TBD. But, Saturday brunch will be at The General Muir (!!!) and I can hardly wait. The interior design of the restaurant is moody and perfect and, just, *SIGH* - check out my insta stories for more of The General Muir on Saturday - not to mention the menu looks delicious (hello bagels and lox). Hope you all have a nice weekend enjoying the cooler weather! Get outside and do something fun!